It's been awhile since we've featured an article from our friends at www.metalflakes.com, but this month they gives us a double dose of heavy metal with Ronnie James Dio and HammerFall. Also, check out their site for some autographed CD contests! Most can remember in the late seventies and early eighties, the boom of metal bands from England. America fell in love with the new music that came along about that time. You know the list of bands….. they make up a big part of most any old-school metal lover's top ten. Amazing musicians from England dominated the heavy rock scene, and many went on to become icons of a generation. While all this attention was placed on England and the musicians and music it was giving, one of our own Americans joined the fray, one who not only was able to keep up, but also helped to musically define a generation. He has since become a heavy metal icon himself, as one of the godfathers of a genre. That American is Ronnie James Dio. Ronnie James Dio is proficient at using all the elements that make metal what it is. He remains as relevant today as he ever was in the past. He has rocked over three decades of fans of all ages and here and now, is still going strong and solid. Ronnie James Dio has proved he can still rock at a time when seasoned musicians are being mocked for their age rather than appreciated for their skill. Our old school favorites have put on weight, slowed down, lost creativity, lost quality in their talents, developed problems due to prior excesses and all kinds of hinderments. Minus a couple of insignificant small changes such as some smile and laugh lines and a tad less hair, Ronnie James Dio remains exactly as he was when he came on the scene originally, not only physically, but also vocally and creatively. He has lost nothing over the years, his consistency and integrity remain in tact. 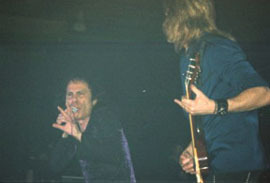 Metal Flakes was able to see Dio this week on their American tour for Killing the Dragon, newly out on Spitfire. Though the Dio band's musicians have changed out over the years, you can tell how much of the band is Ronnie James Dio by the way the music's style and sound have remained truly Ronnie James Dio through all line up changes. After our show we spoke with Ronnie and commented on how vast the age range of people coming to his shows is. We saw really young people, people on the far end of middle age and every age in between. The young however are really young. Ronnie commented, "Yeah we have a lot of young guys and girls that come out and that's great, you know why? Because they GET IT!" Do you get it? Go see Dio while you can!! Today's Dio line up brings us, Doug Aldrich on guitar, Jimmy Bain on bass, Simon Wright on drums and Scott Warren on keyboards. 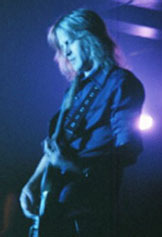 Doug Aldrich…….WOW! The man of the hour, who I hope to see lots more of in the future. I honestly feel he is the best guitarist the Dio band has ever had. Now I know there are some Vivian Campbell supporters who will doubt me, however you just have to see Doug and how great he is on Dio's previous works. Get the new CD and see how astounding he is on his own works. I had read many passages around the web after this summer's tour with Deep Purple and The Scorpions where people were asking, "Who is this new guy, where did he come from?" (See House of Lords and Hurricane) Yes, he is kind of new to things in the spotlight, however, if you go see him, you will note as well as I have, that he is here to stay and has well proven that he should be. Jimmy Bain has been with RJD as far back as Rainbow Rising. He would join RJD for the formation of Dio in October of 1982, twenty years ago, and remains with him today. Simon Wright couldn't possibly be a slouch with bands like AC/DC on his resume. He keeps the backbone of Dio's music strong and solid and is very entertaining to watch as well. He takes a drum solo on this tour's performance, which is a rare thing these days and a treat to hear as well as watch. Scott Warren brings the mystical and melodic keys to the fold to complete the sound that makes up Dio. Scott can be traced back to Keel, Warrant and Julliet. Speaking of old-school and youth, opening for Dio, we had the pleasure of seeing Sweden's HammerFall for the first time. These young guys are fun….f…u…n…fun. On a side note, the first HammerFall song I had ever heard, was a cover of Man on the Silver Mountain. A newer band with an older sound, and they had my interest.Due to the absence of old school classic styled metal on the market these days, I was very interested.I started picking up their releases and keeping an eye on them. I got to see them live and in action this night with no clue what I was in for. I have to say right off, they needed a bigger stage! They are so full of energy, they need the room to get it out. Their sound was tight, solid and crystal clear. Then I got notice of the stage moves. At first I laughed because it's been so long since I've seen moves like these. Then my second reaction was "awe", like a proud parent would feel. They all line up and move the same ways at the same time and head bang together and things like that. Nothing we haven't seen before, but something we don't see much of anymore With the stage clothes, locks and locks of hair, and moves it was sort of a Manowar meets Iron Maiden meets Saxon kind of vibe. I watched their short 30 minute set, as they absolutely rocked that room and everyone in it, the crowd loved them. I was thinking to myself, "Back in the day, they would have headlined arenas." 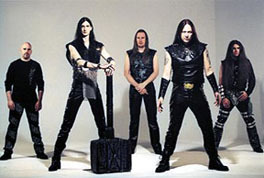 HammerFall aren't really all that new, they have been around a while and have four releases under their belt. They are popular in Europe but have yet to catch on heavily in America. Let's change that. Check them out then tell your friends. They want to take everyone back about twenty years, with fresh material, and I am all for that. If you have found yourself saying in recent times, "There's nothing good out there anymore", then you are probably missing the good ole days and need to get familiar with HammerFall. Go see them while you can! They do not disappoint. The only disappointment I felt was that it was way to short a set. HammerFall are on this tour in support of their new release Crimson Thunder, new from Nuclear Blast.